These courses will help you to have an understanding of how Occupational Therapy can provide Complementary and Integrative Health approaches with a Holistic philosophy. 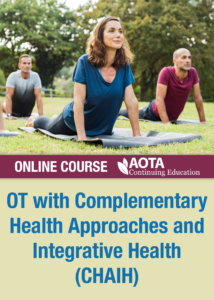 “Occupational Therapy with Complementary Health Approaches and Integrative Health” is available as an online webinar through the American Occupational Therapy Association. Go Here to take the course. Complementary and Integrative Health approaches may be used in occupational therapy practice to enhance health, wellness, and prevention, and improve occupational performance. This course will give you an introduction to this area of growth in health care and approaches that can enhance your OT practice. 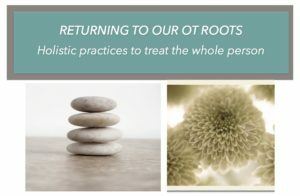 Learn about Complementary and Integrative Health approaches such as yoga, meditation, and aromatherapy that can be used for self-care and in your OT practice. Define Complementary and Integrative Health, and how it may enhance occupational therapy practice. Describe the benefits of 5 Complementary and Integrative Health approaches. Describe 3 ways to document OT interventions that include Complementary and Integrative Health. This three part webinar series consists of practical skills and training related to cutting edge practices in the field of mind body medicine. Each webinar offers concepts related to incorporating higher level ADL’s and mind body practices into clinical OT practice. Discussion will also emphasize self care practices for the OT and ways to enrich resilience, avoid burnout and teach others how to have a greater awareness of these lifestyle concepts. This course will be recorded and students will receive continued access to these courses for review.